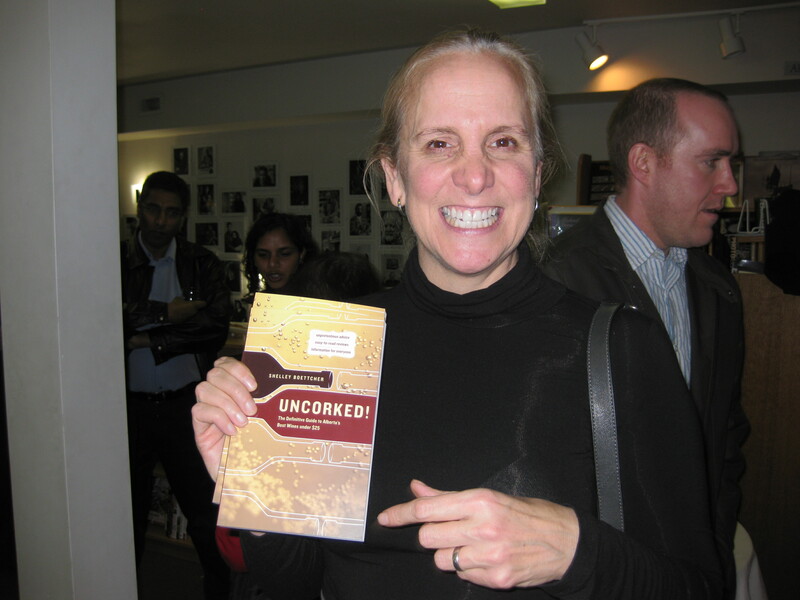 Shelley Boettcher — incredible writer, editor, friend, mom, all-around-superstar — has a new book out, called Uncorked! The Definitive Guide to Alberta’s Best Wines under $25. 2) We believe this handy, fun book will make for the perfect Christmas gift. Perhaps we’ll pair it with a bottle or two of Shelley’s picks for extra points. 3) We really love Shelley Boettcher. 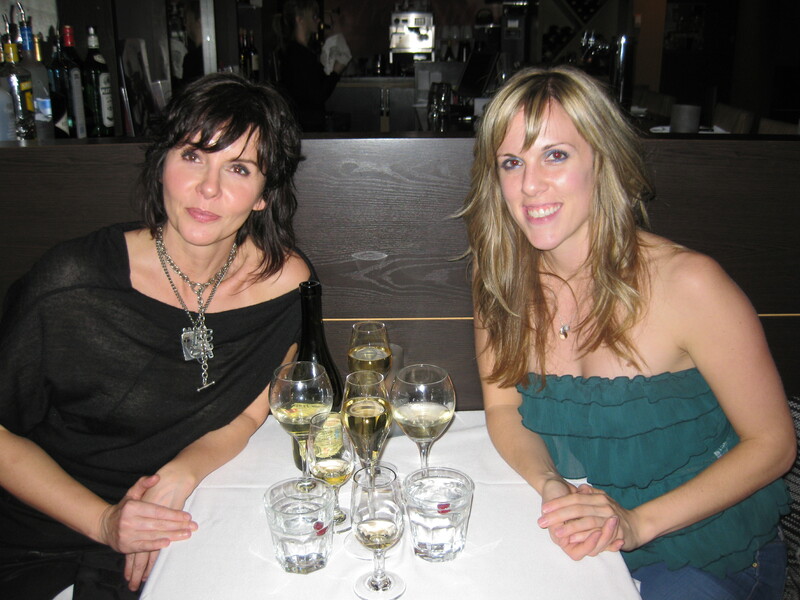 For three years, Shelley and I sat about five feet from each other in the newsroom at the Calgary Herald, writing for the Real Life section. I heart her. Shelley is such a stellar, talented woman. And she sure knows her vino. We celebrated her new book last Friday at the charming Pages on Kensington bookstore. 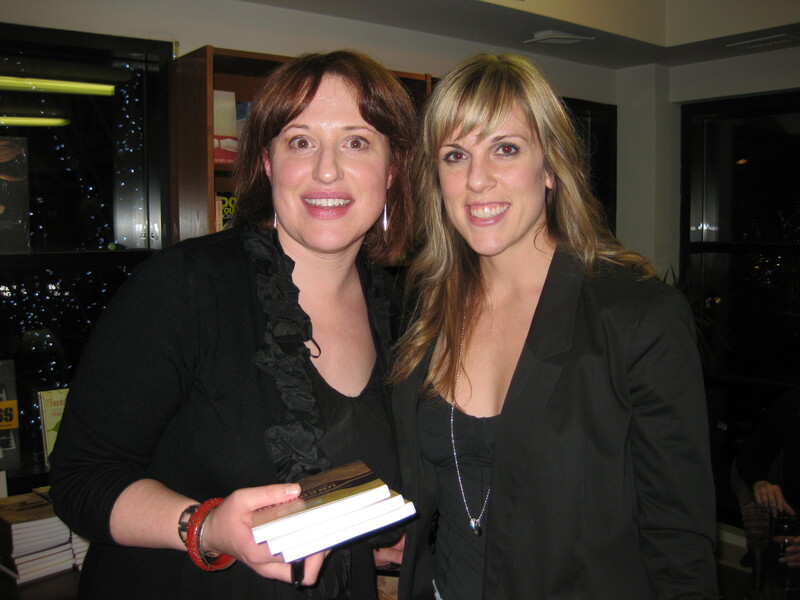 Shelley, me and the handful of books I bought. 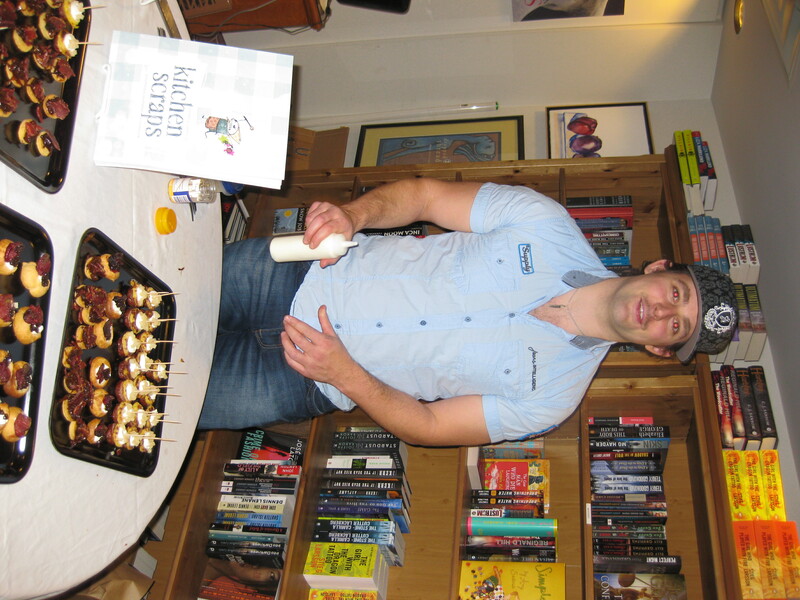 Pierre Lamielle, chef and author/illustrator of the cool cookbook, Kitchen Scraps, provided some tasty morsels of goodness. Wonderful shindig. Wonderful book. I can’t wait to hit the liquor store with Uncorked! in hand. For the last two years, Monday has been the official day of our weekly ritual — the Toque Girls Triathlon. Brace yourselves, this one’s brutal. 2. Next stage, one hour of lifting weights under the directorship of a muscled goddess who could crush a man with her thighs. She makes sweat drip off our elbows. I didn’t know that was possible. 3. 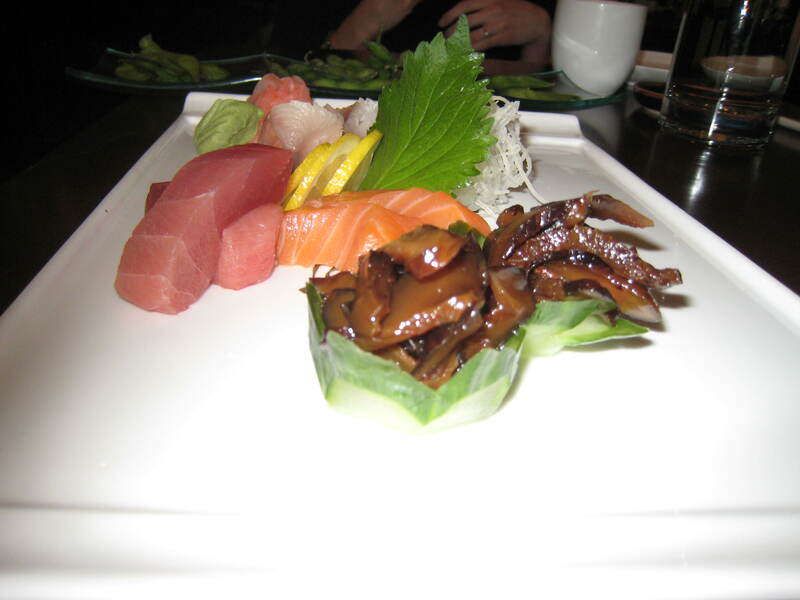 Finish with dinner at one of our favourite sushi spots, Wa’s or Hana Sushi. We spend most of dinner contemplating picking sushi off the plate with our teeth to spare our sore arms the agony of chopsticks. Both Wa’s and Hana perfectly fit the bill for post-workout sushi: casual atmosphere, high-quality fish, solid menus and friendly, efficient service for two starving triathletes. There’s only one thing missing: brown rice. Brown rice sushi tastes better than the white variety and offers more health perks. Brown rice, like brown breads, undergoes less nutrient-depleting processing. And when you’re so tired that chopsticks feel like barbells, you need all the nutrients you can get. Sure, purists will say that brown rice sushi lacks authenticity. To that, we say sometimes a little inauthenticity is a good thing. Take such fine examples as gingerbread lattes, chocolate’n’fruit pizzas and peanut butter hummus. Can you recommend anywhere in town that serves brown rice sushi? It’d really help two triathletes with their training. Our sore biceps thank you. PS – In the meantime, we”ll vouch for the double happiness roll at Hana’s and anything from Wa’s, particularly the sashimi plate and the unagi roll. 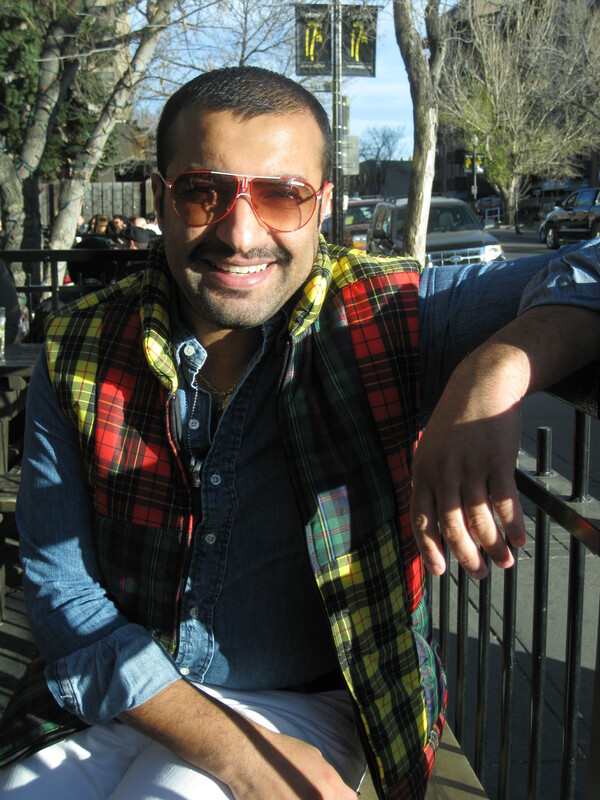 Haithem, 37, is one of those rare people that will call it like he sees it, which is why we thought it appropriate to ask him a few — okay, five — questions. To conduct this very, very serious interview, we met at the Ship & Anchor last Sunday. The balmy weather enticed us to the patio. And then the balmy weather enticed us to order Caesars. And then, somehow, we forgot about the interview. 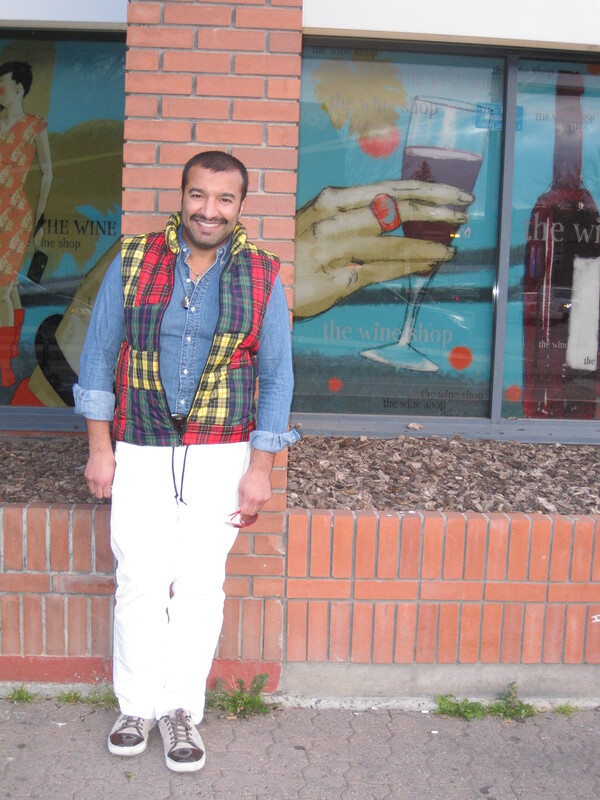 What’s the best thing about Calgary fashion? It’s young! And there’s a lot of potential and possibilities. People need to appreciate local design, though. The only way the local fashion scene can move forward and improve and grow is with the consumers. They have the power and they need to realize that local fashion is very exclusive, because it’s small production and likely produced right here in Calgary. People should feel great about buying something local! You just came back from Europe. Were the women there wearing amazing fashion-forward styles we need to know about? Fantastic heels, like heels that take you up to heaven. That’s how high the heels are. I don’t know how they walk in those heels, with their cobblestone streets. And anything with a very interesting heel. It seems like there’s a lot of focus on the back of the shoe, like a zipper going down the back. On a Saturday morning in Calgary, where are we likely to find you? Probably in bed with Eric watching TV — probably the food channel — and drinking coffee. We’d be thinking about food and whether we should go out to eat or make something crazy at home. 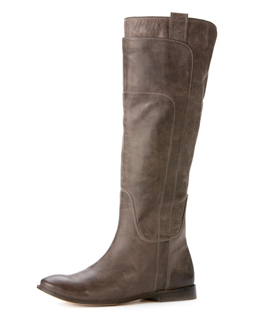 If you could suggest Calgarians buy just one must-have item for winter, what would it be? It would probably be a very nice-looking piece of outerwear, something sophisticated. It could be Moncler or Canada Goose. 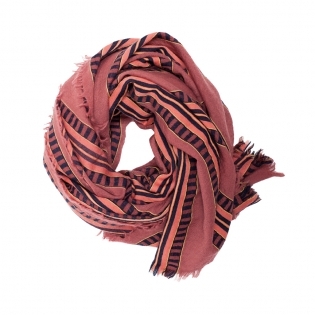 Something very chic, because I find that people don’t care when it gets really cold and they just throw on whatever. They could have the most fabulous-looking outfit underneath but they just want warmth. So, I’d say invest in a nice piece of outerwear. Toques: love them or hate them? I love them. I’ve only managed to find one toque that I can feel comfortable wearing. It’s black and it’s Prada. This one toque, I feel like it’s part of me. And that’s the most important thing when you wear a toque – you forget that it’s even there. Have you ever heard of Leslie Neufeld? He was born in Nipawin, Saskatchewan in 1922 and was one the first Canadians to land in France on D-Day, June 6, 1944. He died early that morning in an assault on a concrete bunker. His last letter home to his parents is one of a remarkable collection of letters put together by Canadian Letters and Images Project, an online archive of the Canadian war experience. If you can’t make it down to the Remembrance Day ceremony today, or even it you can, take a few minutes and browse through some of these old letters. I ended up skipping the gym last night because I was caught up with Gordon Morrisette’s letters to Marjorie, who he eventually married — six years after he got home. And, the letters of the three Bell brothers. Read James‘ letters, especially. You’ll follow his training in Calgary, his discovery of the Rockies, his very surprising and quick wedding to a girl from Coleman (He writes to his mom, “I think I know what I’m doing.”), and the sad letter to his family from his Wing Commander describing James’ disappearance somewhere over France in 1944. My time for writing is very limited. However, I must write a few words just to let you know how things are going. First of all, thanks a million for the cigs and parcels and letters. Received your letter, Dad, just a day ago. By mistake I received Len’s cigs too. Sorry Mum that I don’t have time to answer all your questions now. When Women’s Health magazine published a story in November called “125 Best Packaged Foods for Women”, I thought, “Yes. Fill me in, Women’s Health.” I love the magazine, often tearing out workouts and recipes to try. This story, I thought, would be good. If you read my Monday post, you’ll know that chocolate is something I’m fond of. Same goes for chocolate milk. Finding a tasty chocolate milk without a bunch of sugar seemed like a great idea. 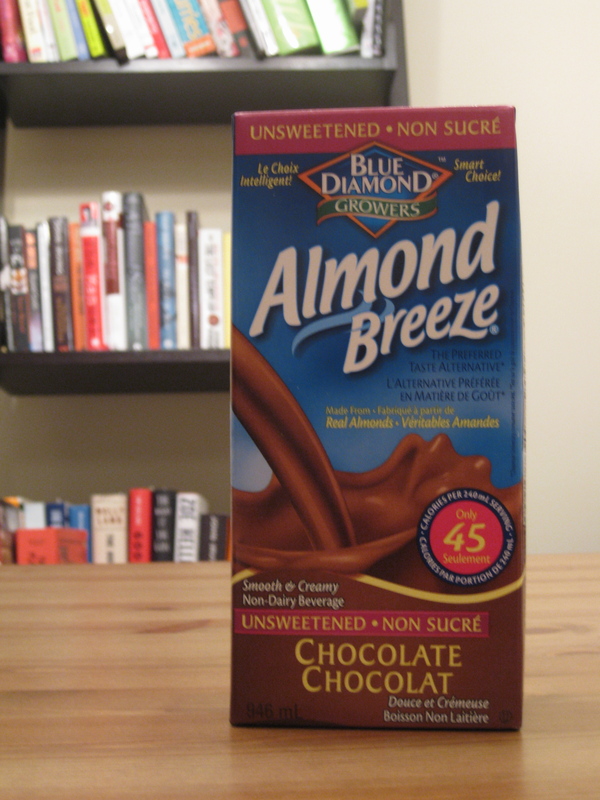 So, when I saw the carton at the store, I decided to give this unsweetened version a whirl. The verdict? Turns out that what I like about all the other chocolate milks is all the sugar. Who knew. Instead of waste my carton of BDNABUNDBC (for short), I decided to improvise. And this is what I came up with: a tasty post-workout protein shake that’ll satisfy your chocolate cravings and leave you feeling satisfied. I call it The BDNABUNDBC Boost. It’s catchy, no? 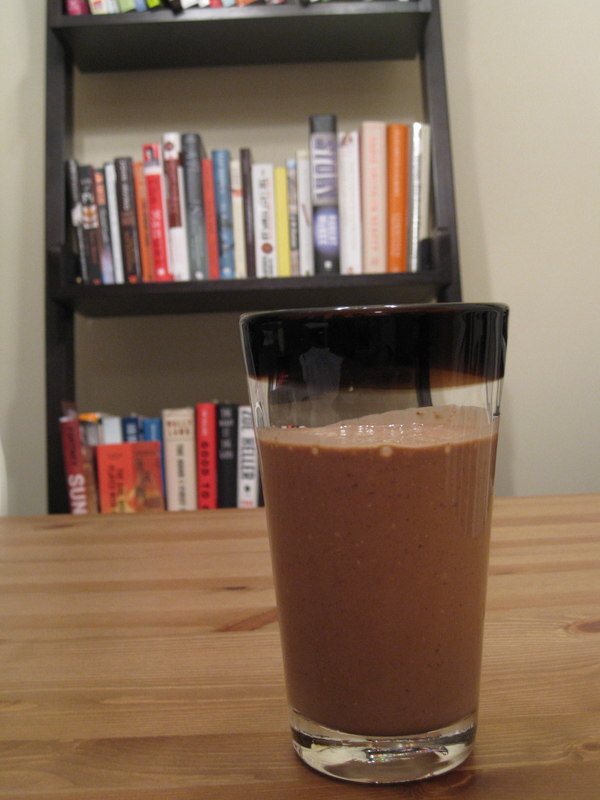 Pour a cup of the BDNABUNDBC (or a chocolate milk with “all the sugar”) into your blender. Add one banana. I prefer mine frozen because it makes the shake thicker, but that’s up to you. Add one heaping tablespoon of natural peanut butter, or any nut butter. Add one heaping scoop of chocolate whey protein powder. Throw in two tablespoons of large-flaked oats. Add a pinch of ground flax seed. Brrrr, it’s cold out this morning. And I have a cold. So I’m not leaving the house. Yep. Maybe then I’ll go outside. Welcome back to the real world, friends. The weekend went by much too quickly, we think, but the extra hour of sleep wasn’t too shabby. I’d been to Beat Niq Jazz and Social Club before, the wicked jazz club that’s directly beneath Piq Niq, but I’d never eaten upstairs. I’m so glad we rectified that situation on Friday night, because the food was incredible. We started with brie- and truffle-covered asparagus. 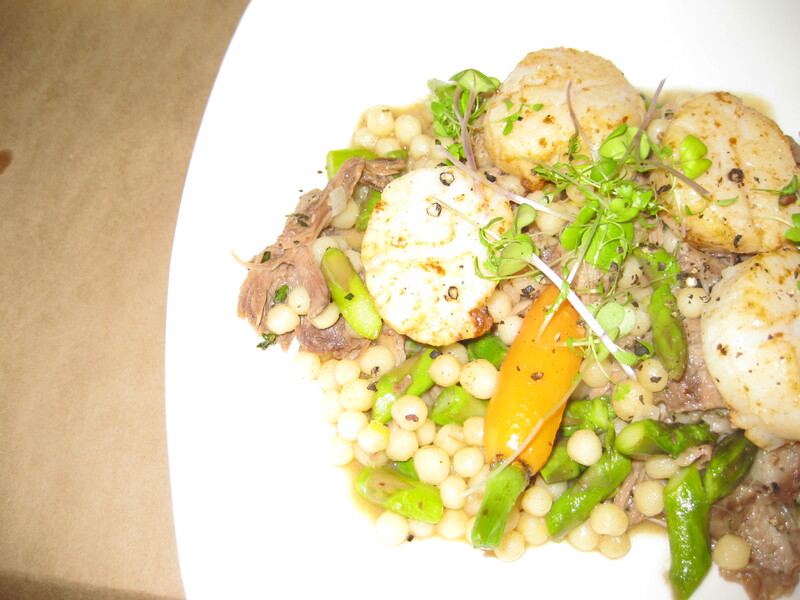 Then, we ate seafood; Mandy had halibut and I had scallops. They were fantastic, and the best part was they were sitting atop a lamb couscous ragout that makes my mouth water just thinking about it. I was ready to call it quits at that point, but our waiter wasn’t willing to let us leave just yet. Correction: he wasn’t willing to let Mandy leave just yet, for the man was bewitched with her. He convinced us to order dessert, a Bernard Callebaut chocolate terrine. Oh. My. I love chocolate and certainly eat enough of it to know that, on the scale of one to 10, this dessert packs a solid 16. 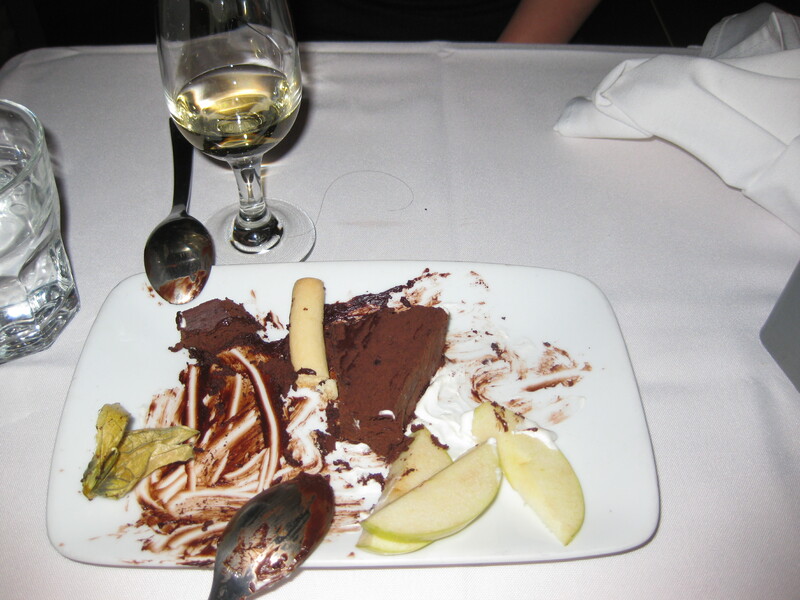 Having finished our wine, a dessert wine and nearly every morsel of food that crossed paths with our mouths, we finally threw in the towel. It was an amazing meal. (I mean, just look at how happy we are. And how many glasses of wine are on the table. Wow.) We’ll be back another time, you enamored waiter, you. Don’t fret. You’ll see her again. Nerd alert: We pretend-write letters to people about things we didn’t, wouldn’t or couldn’t say in person. That is, we imagine what we’d write and then never do. 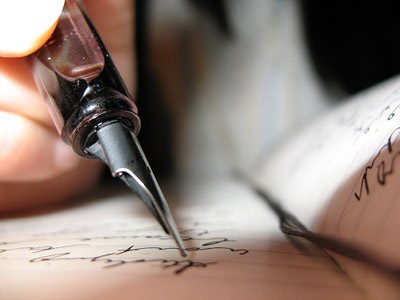 It’s a brilliant series of letters written anonymously by readers to a person or thing. Some are funny (To My Son’s Tonsils), others shocking (To the Woman Whose Husband I’m Having an Affair With), all are entertaining (To My Ex-Fiance). It’s a wonderful way to kill some time on a Friday afternoon while you’re waiting for the end of the day. Have a good weekend! We’re off to the Millarville Christmas Market. It’s always one of our favourite fall days. We drive out to the country, drink strong coffee and taste-test everything under the sun. 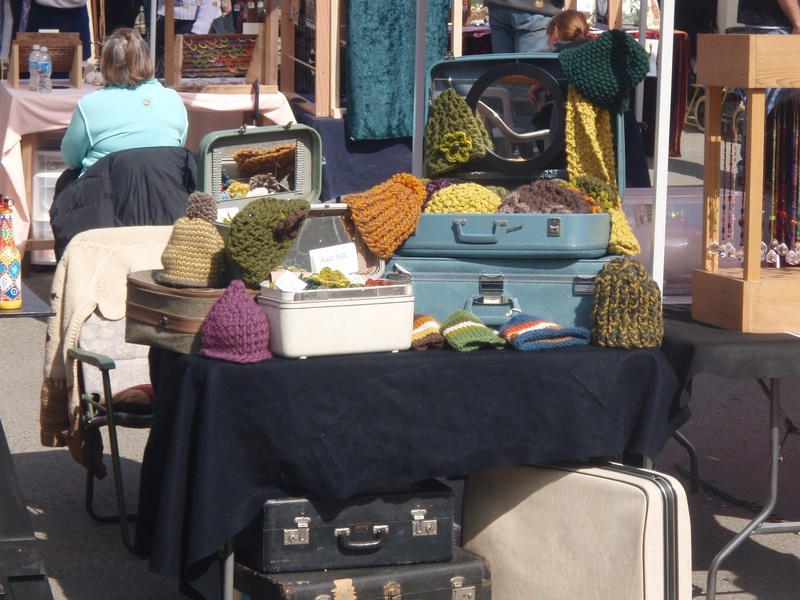 PS – If you can’t make it to Millarville, check out the Make it! The Handmade Revolution at the Calgary Chinese Cultural Centre. It’s a great collection of artists, designers and other cool types. We’re pretty smitten with Knit Wits, two girls based out of Salt Spring and Fernie. Wouldn’t you love to rifle through these cases? A couple of months back, I was sitting at one of my favourite watering holes in Calgary, Local 510. It was not, however, one of my favourite evenings. Things were not so hunky dory with the man friend I was dating, and we were having a serious conversation while sitting at the wood. He drank beer. I drank wine, and felt sorry for myself. I’ll spare you the details, but I ended up excusing myself to use the washroom. A little moment to myself would do me good, I thought. I shut the bathroom stall door and just stood there. And then, I noticed it: one simple handwritten sentence on the top of the toilet paper dispenser. I stared at it for a second. 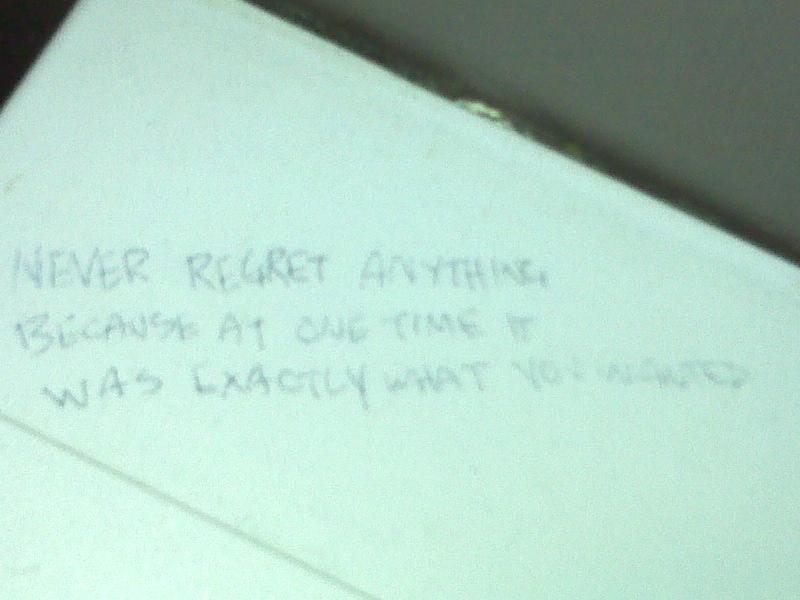 It kind of felt like God was talking to me, right there in the Local 510 bathroom stall. Okay, it wasn’t God; it was probably an 18-year-old girl who was half-cut and on her way out the door for a smoke. But the message felt like it appeared at just the right time. I’m not sure why, but the words calmed me down. They reminded me that I’d made the choices to get me here. That I’d continue to choose and to steer my life in the direction I know I’m heading. And that I shouldn’t regret a single thing. I was back at Local 510 last weekend (tip: try the meatloaf — it’s amazing). Time has passed and things have changed in my life. When I ventured downstairs to the bathroom, I wondered if the tidbit would still be there. It was, and it made me smile. I’ve done some pretty nutso things in the name of yoga over the years. I once lived in a tipi with a friend and two strangers for a week so we could practice waterfront yoga three times a day. I taught a mini-yoga class to a friend and some dude named Bernie as we hung, trapped and freezing, in a broken ski gondola for five hours. I’ve woken up at ungodly hours — willingly — to chant in Sanskrit, and then balance off my arms. Yes, yoga mats can be super slippery. But, generally, only when they’re new. So before you use ’em, wash ’em. Yes, in the clothes washer. If you have a big fat mat like mine that doesn’t fit into your condo-sized washer, wash it in your mom’s washer. Moms LOVE that. Don’t use soap — we’re trying to get rid of that slippery coating, remember? Incidentally, most mat manufacturers specifically recommend you don’t do this. But for cheaper mats in particular, the washing machine works wonders. And you should wash your mat regularly. Because it’s kind of gross not to. If your mat smells rubbery, rub apple cider vinegar onto it. In my own experience (Disclosure: I have not done valid scientific trials), vinegar beats fancy aromatherapy oils hands down when it comes to getting rid of rubber smells. If you spend time in hot, humid climates, be careful when you roll out your mat. Cockroaches love yoga, too. When you go to bed at night, they’ll scurry into your rolled-up mat and play cockroach zen games all night long. They’re still there, legs all-folded up Buddha-style, when you roll it out in the morning. Don’t dress in heavy clothing for a hot yoga class, obviously. But, sometimes, you’ll want leggings. Like those wide-legged bends where everybody can see into where your sun don’t shine. Mostly, though, you’ll wish you had something on your legs when you get to arm balances. Slippery sweaty arms + slippery sweaty legs = broken nose. That’s my paranoid way of thinking, anyway. Namaste and top of the Wednesday morning to all.